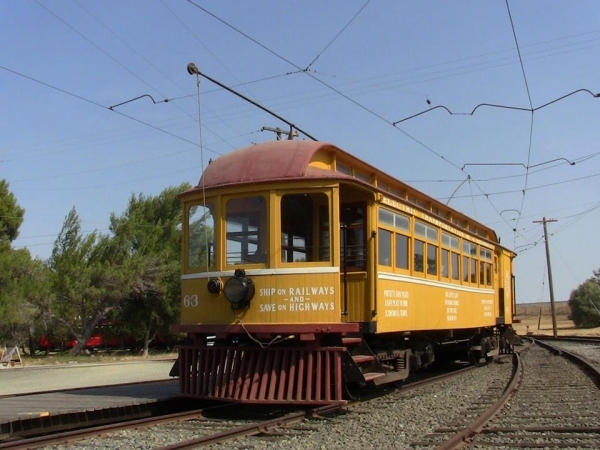 Petaluma and Santa Rosa 63 is a wooden combination baggage and interurban car with clerestory roof. It is a double-end, double-truck car. This little wooden interurban car was built in San Francisco by the Holman Car Company in 1904. It ran between Petaluma, Sebastopol, and Santa Rosa with a branch to Forestville. Passenger service on the P and SR ended in 1932 and this car was dismantled. 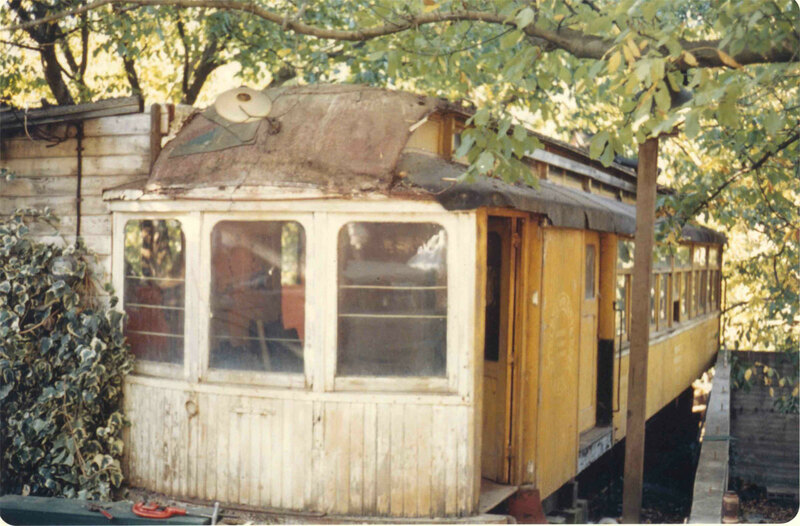 The carbody was used as part of a house in the hills west of Fairfield until it was acquired by the Association in August 1967 and moved to the Museum on November 27, 1967. Members of the Association tore down the house to get the carbody out of it. The car was restored to an operating car at the Museum. Trucks and traction motors were salvaged from Yakima Valley box motor 301. Vintage Caption: P&RS #63 as it was when acquired. The addition on the left was left behind. Technical Data: Small wooden combination interurban car. Built by Holman Car Company of San Francisco in 1904. Seats 44 passengers. Weight, carbody, 21,340 pounds; trucks, unknown; total weight, unknown. Trucks: Brill 27MCB-2. Wheels, 33-inch diameter. Axle, 5”. Journals, 4 1/4 X 8 plain bearing. Traction motors, 2-65 horsepower @ 600 VDC, inside hung. Air Brake Equipment: Westinghouse Traction Brake, SM3. Motorman’s valve, PV-1. Emergency Valve, H-1. Brake cylinder, 10 X 12. Main reservoir protection valve. Governor, GE Type ML. Air compressor, Westinghouse Air Brake DH-16. Dimensions: Width, 9’ 0”. Length over buffers, 44’ 5”. Height, 13’ 1 1/4” over trolley base. Truck centers. Truck wheelbase, 72”. Propulsion Equipment: General Electric type K. Controller, K 28-J with cam switch added. Traction motors, General Electric GE-201-P. Gearing, bull 71 teeth, pinion 15 teeth, ratio 4.71 to 1, 5” face. Control switch, MS-46. Line breaker, DB987. Power resistors, Westinghouse edge wound ni-chrome. Misc Data: Couplers, None. Heaters, None. Trolley wheel, 6” Ohio Brass Form 6. Trolley base, US 20. Trolley catcher, Ideal, made by The Trolley Supply Co. of Canton, Ohio. Air Whistle, Kinsley. Current Condition: This car is complete and operational and is in good condition. It was restored from a stripped body in the Museum’s shop. Proposed Future Treatment: Maintain in current condition. Replace trucks with more appropriate trucks if they become available.